A new favourite recipe jazzes up any menu. This easy pumpkin roll recipe is easy to make. 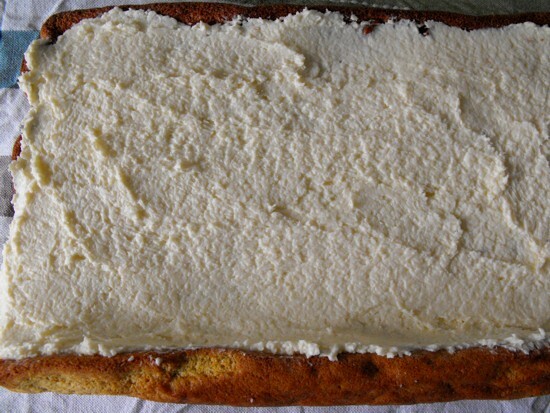 The recipe is a variation to the sponge cake recipe. 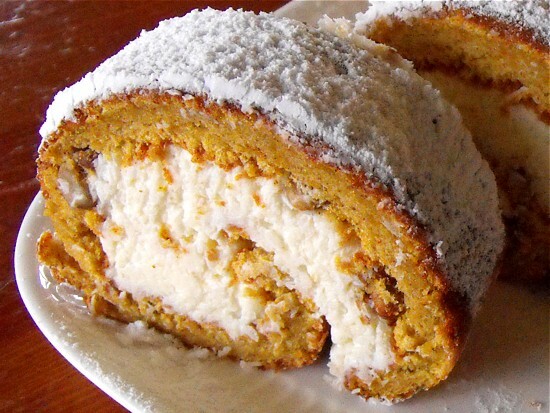 The pumpkin cream cheese roll is very tasty and is well suited to be prepared in advance. The decorative pumpkin cheesecake makes a delicious treat or a light pumpkin dessert. It was so yummy we just had to repeat it the next day. Tell the world about an exciting easy recipe using pumpkin? Take a glass or a cup to separate the egg. This serves two purposes. When breaking the egg and the egg yolk accidentally mixes with the egg white you don't loose the eggs you have already skilfully separated into your bowl. You can determine whether the egg is still good for consumption. Line a baking sheet with baking paper. Pre-heat the oven to 180C°. Convert! 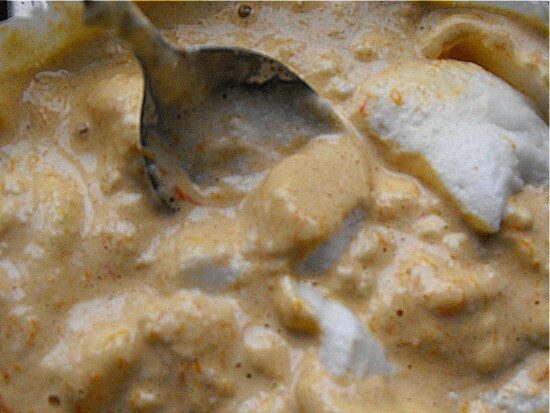 Use two mixing bowls and separate the three eggs into egg yolks in one bowl and egg whites in the second bowl. 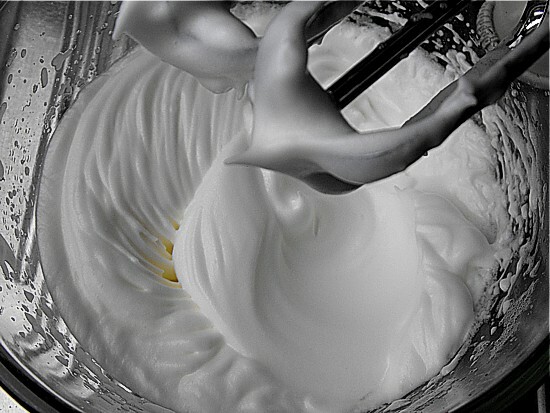 With a hand mixer mix the egg whites until they are white and stiff. 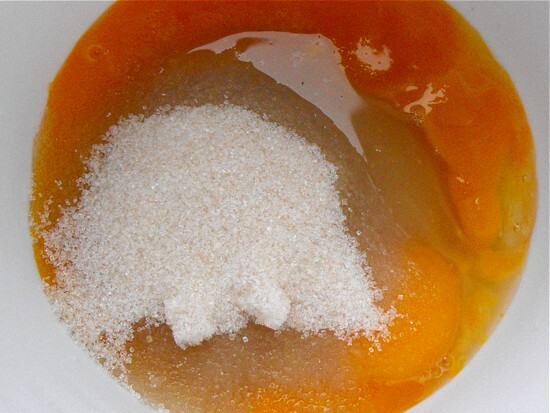 Into the second bowl add three tablespoons of water and two thirds of a cup sugar to the three egg yolks. Mix all three ingredients at high speed until foamy and almost white. Mash two thirds of a cup of steamed buttercup pumpkin or butternut squash with a fork and add them to the foamy egg yolk mass with a heaped teaspoon of cinnamon. With a spoon or a spatula fold the stiff egg whites under the egg yolk, water, sugar, flour and pumpkin mass under, until the two masses are just combined. 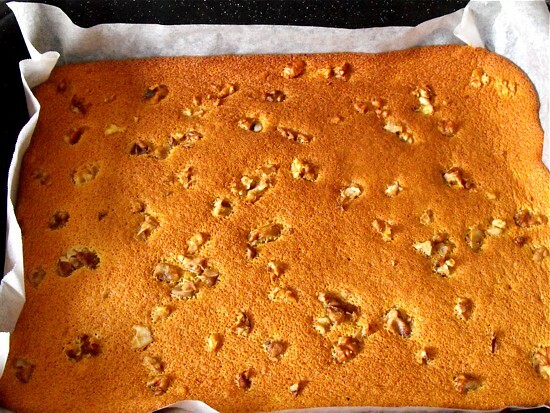 Fill the mixture onto a baking sheet and spread evenly. Then sprinkle the half cup of walnuts on top. Bake for 20 minutes at 180C°. When the surface shows a light golden colour take it out of the oven and flip it onto a paper towel. Remove the baking paper carefully. Place a fresh kitchen towel on top. Flip it back onto the baking sheet and roll it up. (We roll so that the bottom of the cake which was facing the pan as it was baking is on the outside, because it seems that the side exposed during baking tends to break more easily.) Start rolling from the longer side of the rectangle. Leave on a cooling rack until completely cooled. In a mixing bowl fill in the two hundred and fifty grams of cream cheese, the cup of desiccated coconut and the two tablespoons of sugar. 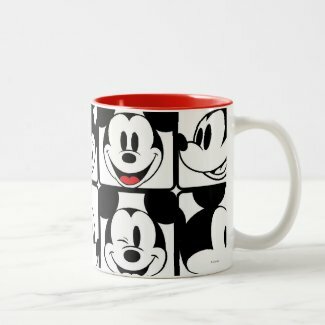 Blend it all together. 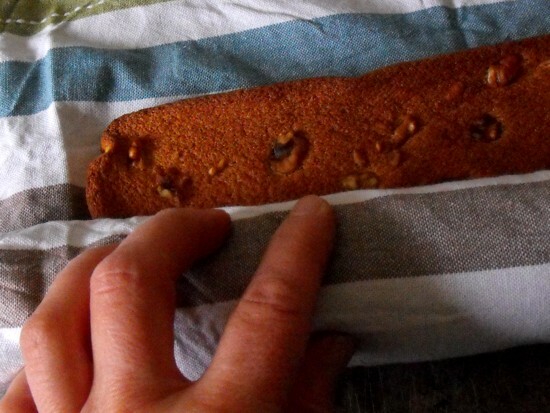 When the cake roll has cooled down unroll it and spread the filling over evenly. Roll it up again and place it onto a cake plate and dust with the icing sugar. Refrigerate for half an hour or longer and serve. The cake can easily be prepared a day in advance. If you have tried this pumpkin roll recipe yourself, please return and let us know how you got on and how you liked the outcome.